My friend introduced me to Mezze Cafe in Chatswood soon after I started working here. We were meeting for lunch and she suggested a few places where we could go. I was immediately drawn to Mezze Cafe as they label all their gluten free items. I went there so many times in the first couple of months that they remembered what I wanted everytime, The BIG M salad and a chai tea. The BIG M salad consists of sumac chicken, prosciutto, parmesan cheese, boiled egg, mix leaves, fresh tomato, spanish onion, avocado and harissannaise. The salad is a great twist on a caesar salad and I ordered it all but one time in the first few months when going to Mezze Cafe. The one time I decided to have a change I ordered the Mezze Plate which can be made gluten free on request. Unfortunately though the gluten free option is just the same thing (a selection of dips and bread, grilled haloumi, falafel, sumac & pepper squid and char grilled sucuk) without the bread. Therefore it wasn’t very filling. I recently visited Mezze Cafe again and found that they have changed their menu. I was very disappointed to see that they no longer offer The BIG M salad and therefore ordered the roast pumpkin salad instead. 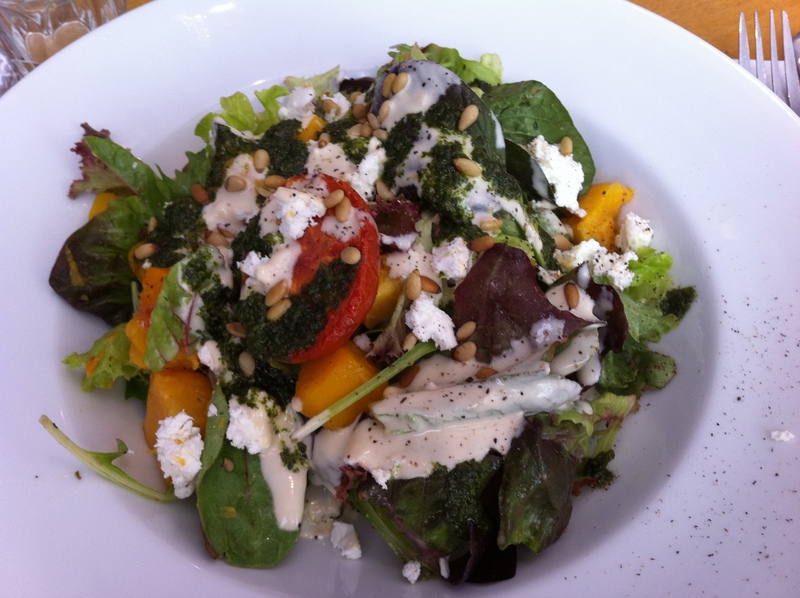 This salad consists of fire roasted pumpkin, feta, roast tomato, pinenuts and spinach, topped with tahini and coriander dressing, however they had run out of spinach so my salad had mixed lettuce instead. The salad was actually really tasty and satisfying. With the new menu there are only two gluten free options, the other is the tuna salad (pan fried tuna steak, boiled egg, spinach, capers, artichoke, spanish onion, tomato and olive tapenade loaf) which can be made gluten free on request (I am assuming they just remove the olive tapenade loaf). Mezze Cafe also have Middle Eastern & North African Yum Cha on the last Friday of every month between 11am and 3pm (see more information here) which I have been told includes gluten free options. I definitely recommend Mezze Cafe if you are around Chatswood and want a nice cafe lunch. Have you found a cafe you love only to find they change the menu?